Rome is full of treaures, historical ruins, works of art, imposing architecture, engineering marvels etc., some in full view, others displayed in museums both public and private. To get into these museums one needs to fork out a certain amount of euros. There are however repositories of some of these treasures that are open and available to anyone, the only requirement to enter is one be dressed "appropriately". These are the churches in and around Rome. It has been an experience for me going into these churches sometimes for the purpose of hearing mass and then finding myself going around taking pictures after. There has been those times too where I have gone to a specific church to look at say a statue by Micheangelo or a painting by Caravaggio and ended up going to mass as well. Among the thousands of churches, there are three churches in Rome that have been given extraterritorial status similar to that of foreign embassies. Article 13 of the Lateran Treaty of 1929 between the Holy See and Italy states: "Italy recognizes the full ownership of the Holy See over the patriarchal Basilicas of St. John Lateran, the Sta. Maria Maggiore, and St. Paul Outside the Walls, with their annexed buildings." These buildings are patrolled not by Italian police but by police agents of the Vatican City State. These Basilicas and St Peters are the only four “major” Basilicas in Rome and the Papal Basilica of Saint Mary Major (Basilica di Santa Maria Maggiore) with it's Byzantine interior, one of the best preserved in Rome is the only one dedicated to the Blessed Virgin. It is said that the Basilica stands on the site of an ancient temple to the goddess Cybele. According to legend the Virgin Mary appeared to Pope Liberius in a dream, asking him to build a church in Her honour on the top of the Esquiline hill, on the spot where he would find a patch of newly fallen snow. The next day, August 5, at the height of the Roman summer, snow had fallen on the spot where Maria Maggiore is now located. At the top of the altar of the Borghese Chapel in the Basilica, the event is immortalized in a bas relief sculpture of Pope Liberius tracing the perimeter of the church in the snow. This event continues to be celebrated every year on the 5th of August. During the noon mass, white rose petals are showered on the congregation from the ceiling and at night the fire department operates a snow making machine in the Piazza in front of the Basilica. ﻿﻿The Basilica when viewed from the Piazza of Santa Maria Maggiore stands behind a column on top of which rests a bronze statue of Mary. The eighteenth century facade has a porch with five openings on the bottom and three on the top which covers the XII century mosaics of the antique facade. Clearly visible from the piazza is also the highest campanile in Rome. On the other hand, viewed from the Piazza Esquilino, one sees the apse area and the domes of the Borghese and Sistine Chapels. Entering the Basilica, one is immediately struck by the brilliance of the gilded ceiling reportedly with gold sent by Queen Isabella as part payment of a loan extended by then Pope Innocent VIII to finance Christopher Columbus’ voyage to the New World. The gilded ceiling bears the coat of arms of the Borgia pope Alexander VI, (yes that Alexander) who had a hand in the building of the Basilica while serving as its Archpriest. He undoubtedly had expensive and impeccable taste, this controversial pope, and was responsible for building other noteworthy structures, as well as the aquisition of art masterpieces during his term in office.The beautiful cosmatesque mosaic floor was made by Cosmati, considered the “master of marble” and from whose family workshop these geometric decorations originated. The central nave, is lined on both sides with a series of mosaics from the fifth century depicting scenes from the Old Testament. Below these are Athenian marble columns, 40 in all, which may have come from some more ancient structure and made to fit. On top of the mosaics are frescoes and windows. Right in the middle of the aisle is the ornate canopy, crowned by the triumphal arch, under which only the Pope can say mass. The mosaics of the triumphal arch depict scenes from the life of Christ. The mosaics are vivid and dazzling! And crowned by the arch is the mosaic on the apse, completed a bit later than the arch but just as awesome. This mosaic depicts the coronation the Virgin Mary as Queen of Heaven, surrounded by the saints, angels and pope Nicholas IV who commisioned this. Underneath is the nativity painting by Mancini. Right above the nativity painting and below the apse mosaic is a mosaic depicting the death of Mary. ﻿ On the left transept is the Borghese chapel with its grand altar made of lapis lazuli, on which is mounted the icon of the Salus Populi Romani, which tradition says was painted by Luke the Evangelist, the frame of which is supported by gilded angels. The entire chapel is made of marble with bronze and stucco angels all over the ceiling and walls, and at the center of the chapel is one of the two domes of the Basilica. On the right transept is the Sistine Chapel (not to be mistaken for the one in the Vatican) which is undergoing repairs. I was able to take a picture of the altar, which I think is located at the center of the chapel. This chapel has the other dome. ﻿Between these two chapels in the area called the confessio, one sees a giant kneeling statue of Pope Pius IX, one of the longest serving popes, worshipping the reliquary in the altar. The reliquary made of rock crystal and silver is said to contain some wood fragments from the manger on which the Infant Jesus lay. On Christmas morning every year, this reliquary is brought around the Basilica in procession and then displayed on the high altar. There were a lot more treasure on display at this church, one that struck me was the beautiful wooden cross from the first half of the XV century which is housed in the Chapel of the Holy Cross. On the day I visited, as luck would have it, a group of Benedictine monks were chanting in prayer. It was quite beautiful! The other statue I liked was the statue of Regina Pacis, commissioned at the end of the First World War. The Virgin has a beautiful but sad face. She carries the Child Jesus and her left arm is raised as if to say “Stop”. This is by far the most proactive statue of Mary that I have seen. Near the Sistine Chapel, one comes across the tomb of Cardinal Gonsalvo Rodriguez, Cardinal bishop of Albano, a rather elegant tomb topped with a mosaic. This tomb is said to be the work of Giovanni Cosma, a member of the marble artists Cosmati family. Outside the Sistine Chapel, and on the steps off to the right side leading to the sanctuary, I came across my greatest discovery, the tomb of the Bernini family, including the great Gian Lorenzo Bernini himself. It is very simple, not even a tomb, just a stone slab. 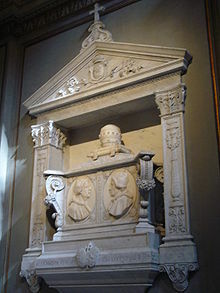 How ironic that one of the greatest baroque artists, a master of the ornate and the dramatic would choose to be buried in the simplest of tombs. Here was a nice paradox; I am inspired to go treasure hunting again, this time in search of Bernini! One of the best gifts I’ve received from my husband is a Kindle, that amazing contraption that allows you to pretty much bring a whole library with you wherever you go. This is a real blessing for “nomadic” people like us, if only because it limits the number of boxes that need to be packed and shipped homeward or onward. Even before coming to Rome, I already had a lot of books in my kindle that were written about Rome or were set in Rome. The last e-book I downloaded was The Borgias by Alexander Dumas (yes, the author of Three Musketeers). The Borgias have always fascinated me, the notoriety, the arrogance and the belief that the world was theirs for the taking, gave this highly amoral family a reputation that piqued my curiosity. I downloaded this book after we returned from a long weekend in Florence where the 15th century conflict that Dumas wrote about, between then Pope Alexander VI Borgia and Savonarola, a Dominican friar was dramatically played out in full public view ending in the execution by fire of Savonarola, condemned for heresy. A small plaque marks the exact spot in the Piazza Signoria (Florence’s most elegant Piazza) where the execution took place. Pope Alexander was born Roderic Lancol i Borja in Jan. 1, 1431. He was born in Xativa, Valencia, which at that time was part of Aragon in present day Spain. He adopted his mother’s family name after his uncle; Alonso de Borja was elected pope and became known as Calixtus III. Roderico studied Law in Bologna, but with the ascent of his uncle to the papacy, he was ordained deacon and made Cardinal Deacon at the age of twenty five. Nepotistic appointments saw him ordained a priest in 1468, consecrated a bishop in 1471 and appointed Cardinal as the Bishop of Albano. 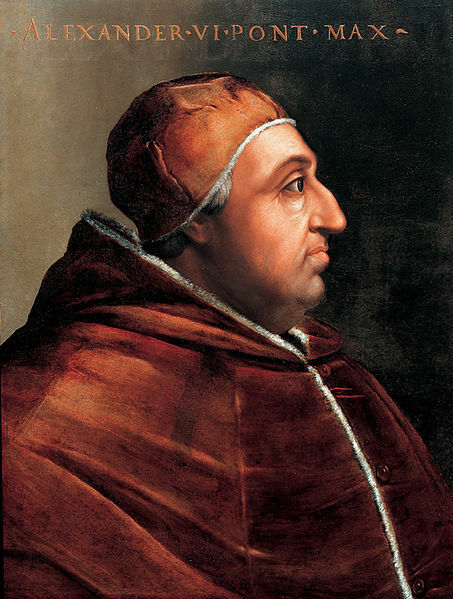 On the death of Pope Innocent VIII, Borja was one of three candidates for the papacy and eventually secured it by engaging in widespread simony. It was rumored that cartloads of gold and precious objects were seen being driven to some cardinal's palaces prior to the election. When he was elected pope he already had children with his long time mistress; Vanozza dei Catani. He not only acknowledged them but was inordinately fond of them and used the resources of the papacy to advance and enrich all of them. They were Giovanni, made Duke of Gandia (reportedly murdered by Cesare), Cesare, Machiavelli’s Prince, the most infamous of his children and the strong arm and ruthless implementer of Alexander's political machinations, Lucrezia, whom he married off three times using her to secure alliances and who as the Duchess of Farrarra became known for her patronage of the arts as well as her piety. He reputedly had other children, but the parentage of these is uncertain. When he was elected pope, his ardor for Vanozza had waned and he had taken on a new mistress, Guilia Farnese who lived with his daughter, Lucrezia in one of the papal households. Alexander ruled like a secular prince of the time, notwithstanding his position as head of the Catholic Church. On the other hand, Giralamo Francesco Savonarola was of noble birth, his family being one of the more illustrious families in Padua. He was born in Ferrara but at the age of twenty three fled from his father’s home and took the vows in the cloisters of the Dominican monks. The Dominicans, one of two mendicant orders at the time (the other being the Franciscans), were founded primarily to teach the gospel and combat heresy and were called Friar Preachers. The members were encouraged to develop “mixed” spirituality, being active in both preaching and contemplative study, prayer and meditation. 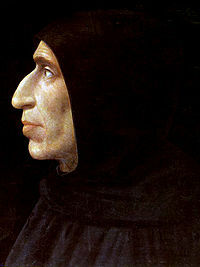 Members of this order were urbane and learned men and Savonarola was to become one of its more passionate members. He became very influential and well respected in Florence early in his ministry and was reputedly feared even by the great Lorenzo D’Medici. Florence at the time of Lorenzo the Magnificent was at the height of its economic and political power. Political and economic wealth led to the pursuit of, and appreciation of more secular concerns. Art and literature flourished and interest in the pursuit of beauty and worldly pleasures did not appear incongruous with the ascetic requirements of Christian doctrine. Into this environment came Savonarola in 1489. Everything going on in Florence (and in Rome) was in complete disagreement with Savonarola’s concept of spirituality and morality. Savonarola, was a demagogue par excellance, and his sermons started to take effect, leading up to the point where he was beginning to acquire political power. He and his followers with the participation of some of the leading citizens held Bonfires of the Vanities, where books, immoral art, mirrors, and other material considered decadent were burned in the Piazza della Signoria. Savonarola preached vehemently against the moral corruption of the clergy at the time, inevitably bringing him into direct conflict with Pope Alexander. Savonarola's fanaticism inevitably led to a defection of many of his followers and in 1497 he was excommunicated by Pope Alexander and then arrested and charged with heresy, sedition and other offences. Under torture, he confessed (but recanted these confessions) to the "crimes" and was sentenced to death. He was burned at the stake in 1498 at the exact same spot where he used to conduct his Bonfires of the Vanities. It was said that his ashes were then thrown into the River Arno. ﻿ ﻿ As for Pope Alexander, after an 11 year reign characterized by corruption, family aggrandizement, selling of church positions and rumors of poisoning and murder carried on by his son Casare with or without his knowledge, he passed away from either malaria or unintentional poisoning (by Cesare) on Aug. 18, 1503. Stories abound that the state of corruption of the body was so bad, leading to speculation that he was poisoned. But it was more likely malaria that killed him as it was prevalent in Rome at the time. As for the state of corruption of the body, this may be attributed to the delay of burial until after the election of a successor at the height of the sweltering heat of the Roman summer. At the time of his death, Alexnder VI was so unpopular that the priests of St. Peter's refused to accept the body until ordered to by the papal staff. It is said that only four prelates attended his funeral and his successor Pius III forbade the saying of prayers for him. 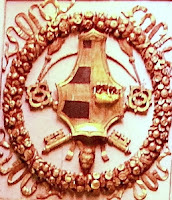 His remains were removed from St. Peters and interred in the Church of Sta. Maria in Monserrato, the Spanish national church in Rome.